Rebecca Siciarz of River Valley Credit Union was named the 2018 Ambassador of the Year during the Huber Heights Chamber of Commerce annual meeting. K.E. 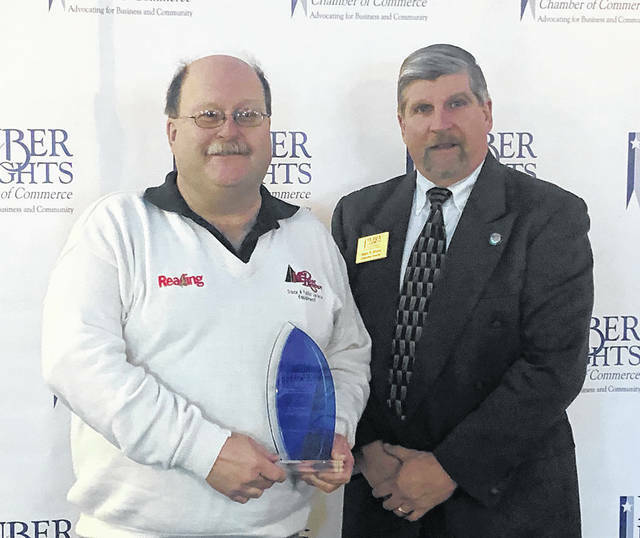 Rose Company was named the 2018 Business of the Year during the Huber Heights Chamber of Commerce annual meeting. 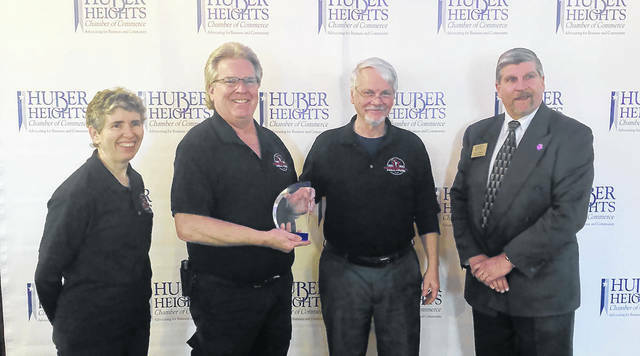 Huber Heights Performing Arts was awarded the Community Partnership Award during the Huber Heights Chamber of Commerce annual meeting. Jan Vargo was the recipient of the Ed Hart Memorial Service Award during the Huber Heights Chamber of Commerce annual meeting. Ms. Vargo was out of town and her family members accepted the award on her behalf. 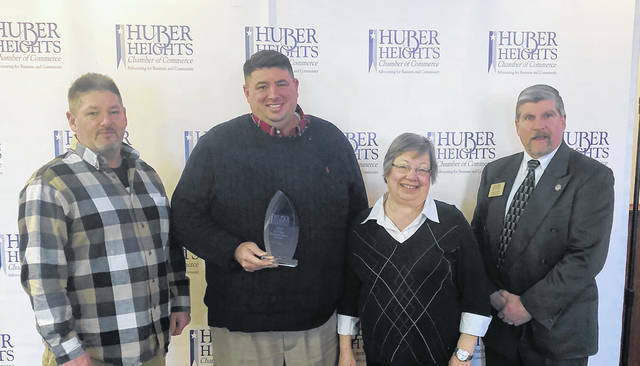 HUBER HEIGHTS — The Huber Heights Chamber of Commerce held its annual meeting and presented awards on Thursday, Jan. 24. Those awards included new members who joined in 2018, the Business of the Year, Community Partnership Award, Ambassador of the Year, and the Ed Hart Memorial Service Award. The Business of the Year is chosen from among the 12 monthly awardees during the previous year and is presented to a business that demonstrates its commitment to its employees and the entire community by setting the example for all businesses. The 2018 recipient was the K.E. Rose Company. Located on Chambersburg Road, the company was originally a landscaping/concrete company. In 1995, K. E. Rose began upfitting and manufacturing truck equipment. That eventually evolved into fabrication and installation of equipment for police and fire vehicles. Departments all across the Miami Valley use K.E. Rose to install equipment in their emergency vehicles. “He has expanded from one building to four and employs 50 people and needs more,” said Mark Bruns, the Executive Director of the Huber Heights Chamber of Commerce. The Chamber s very proud to present the Business of the Year award to K.E. Rose Company. The Community Partnership Award is presented to the Non-Profit organization that works closely with the Chamber of Commerce and other civic groups for the betterment of the community. Huber Heights Performing Arts, previously known as the Huber Heights Performing Arts Hall of Fame, is the 2018 recipient of the Community Partnership Award. Since 2015 the task of Huber Height Performing Arts has been to focus on arts and entertainment and Wayne High School students who have moved on to have careers in the arts. “Huber Heights Performing Arts works in collaboration with Huber Heights City Schools and other non-profit organizations to call attention to these talented artists,” said Bruns. He noted the group holds and induction ceremony and dinner each year and has a Hall of Fame wall at the High School. Long-time resident and city council member Jan Vargo was named the recipient of the Ed Hart Memorial Service Award. The award’s namesake, Ed Hart, was a community leader and business owner. He was a veteran, a founder of the Huber Heights Athletic Foundation, and was instrumental in raising funds to locate a YMCA in the community. The award is presented to an individual who has dedicated themselves to go above and beyond serving and volunteering not only their time and knowledge, but their unselfish dedication to our community. Vargo has lived in Huber Heights with her husband Paul and children since the 1970’s after being stationed in Wiesbaden, Germany. In 1984, Vargo was elected to the Ward 2 city council seat and then the council at large seat in 1991 where she served until 2016. She has served on the Chamber of commerce board of directors, and is currently on the board of Huber Heights Performing Arts. She also serves on the PRIDE Citizens on Patrol program. Vargo was unable to attend the annual meeting due to a previously scheduled out of town trip. The award was presented to her children on her behalf.